The flag of Elbasan County (photo) is green with the county's coat of arms in the center. "Qarku" means "County"
The flag of Elbasan is a banner of the municipal arms in white and green colors. The municipality of Belsh (19,503 inhabitants in 2011; 19,644 ha) is located 30 km south-west of Elbasan. The municipality was established in 2015 as the merger of the former municipalities of Belsh (8,781 inh. ), Fierzë (2,065 inh. ), Grekan (3,136 inh. ), Kajan (3,925 inh.) and Rrasë (1,594 inh.). The flag of Belsh (photo) is white with the town's coat of arms in the center and the municipality's name written beneath. "Bashkia" means "Municipality". The first quarter of the coat of arms features Lake Seferan, located south-west of the town of Belsh. This is the biggest of the 85 karstic lakes scattered over the Dumrea region. 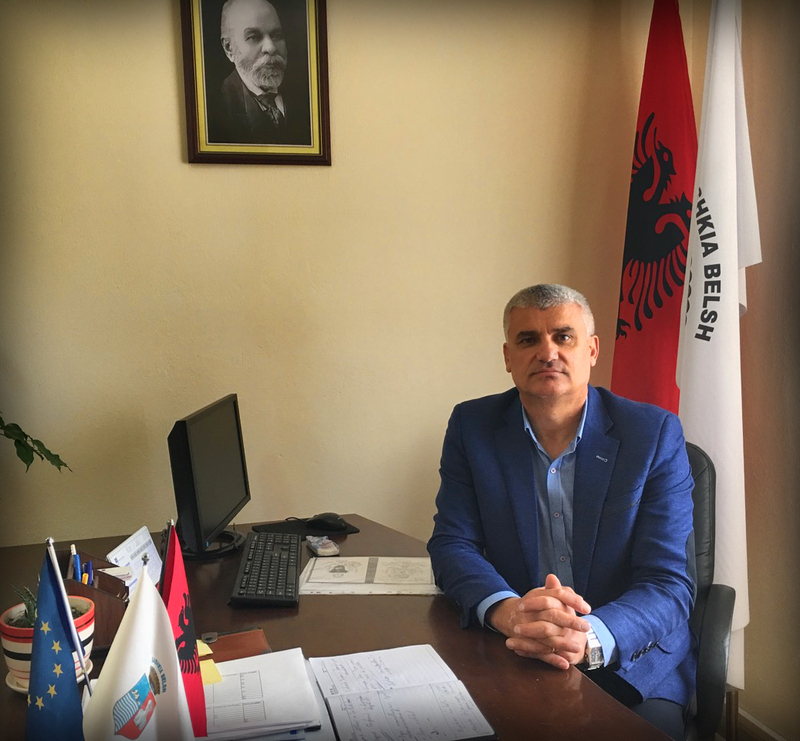 The writer Sami Frashëri (1850-1904, one of the leaders of the National Renaissance movement) said that Belsh should be the capital of Albania, because of its geographical location in the central part of the country and mostly because of the natural beauty of the area. The second quarter of the coat of arms features a terracotta figurine found in 1982 after a drought period that had dramatically decreased the water level of the lake, exhibited with other artifacts at the Museum of the Archeology Institute, Tirana. The archeological site is located 4 km south-west of the Illyrian settlement of Gradishta / Belsh; located at a significant rod crossing, that relatively small settlement (7 ha) boomed in the 4th-1st centuries BC. X-ray fluorescence analysis revealed a great similarity between terracootta artifacts found in Seferan and Belsh, indicating they had been manufactured in the same local workshop. More than 90% of the artifacts found in lake Seferan are women's busts and figurines; Néritan Ceka interpreted the site as a place of worship of an Illyrian deity represented under the traits of the Greek goddess Aphrodite, but with specific Illyrian physical features. Similar figurines found in different archeological sites all over Albania were also interpreted as "Illyrian Aphrodite". Pushed during Enver Hoxha's regime for ideological reasons, but lacking scientific background, this interpretation has been challenged by several scholars. Most figurines thrown in the lake are protomes (busts lacking forearms), naked or clad with a chiton, wearing a diadem or a crown decorated with flowers. In 1931, Christian Blinkenberg claimed that the protomes were not representations of deities but "abridged" versions of full-sized statues representing humans. Accordingly, the figurines of lake Seferan could be interpreted as brides wearing floral crowns. The protomes would be offerings to a deity yet to be identified, since no sanctuary has been found near the lake. The best candidates are feminine deities connected with water, life development and growth, maybe in association with the pre-marriage bathing ritual: Aphrodite, but also Artemis and several nymphs. If this interpretation is correct, the ritual practiced in Seferan would be similar to those common in the Greek coastal colonies of Epidamnos-Dyrrachion and Apollonia, revealing the early Hellenization of central Illyria. The flag of Gramsh (photo) is green with the municipal coat of arms in the center. Librazhd is a town in eastern Albania. It has a population of approximately 9,998. Librazhd is the nearest town to the Shebenik-Jabllanice National Park. The flag of Librazhd (photo) is green with the municipal coat of arms in the center. 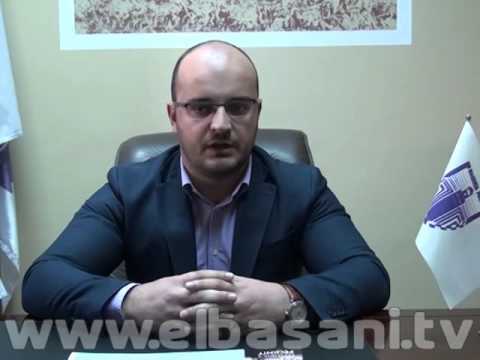 "Bashkia" means "Municipality". The coat of arms features the Bushtrica railway bridge (photo), the highest (47 meters) and longest bridge of the country (built in 1973), and the old stone bridge erected nearby. The flag of Peqin (photo, photo) is white with the municipal coat of arms in the center. "Bashkia" means "Municipality".